To revive the mythical Claude Jutra through his work: that was the mission Marie-Josée Saint-Pierre had in mind when she started the process of making a short animated film on the late filmmaker. Once I got past security, I headed to a patio, where a very stout Gérard Depardieu was eating his breakfast. I was then sent to the pool area, which offered a view of the hotel's stunning architecture. David Cronenberg shook my hand, Xavier Dolan kissed my cheek, and Atom Egoyan ignored me. I stood in front of the cameras with the three Canadian filmmakers in the official competition and with Stéphane Lafleur for a photograph of the Canadian directors selected. Cannes: The trip of my life! 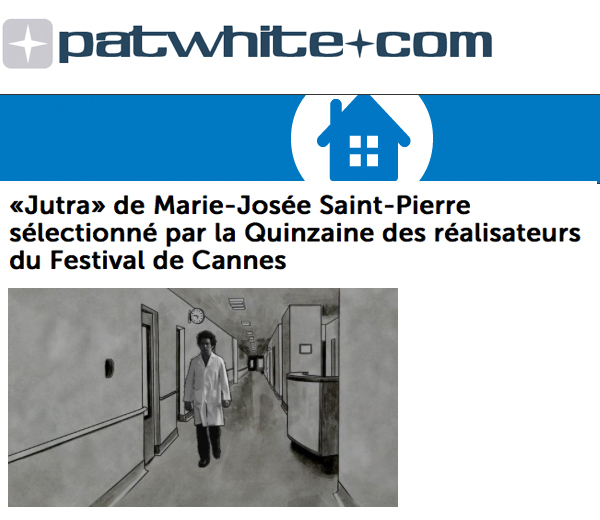 Marie-Josée Saint-Pierre blogs about her impression of the Cannes Film Festival. On La Croisette, jean shorts are walking right next to Gucci dresses. Some wait for the bus amongst myriad luxury cars. Looks are quite important. Even the photographers dress up as penguins, creating a row of flashing cameras, perched on an alley of ladders. Hot Doc: Fench documentaries take the stand. Jutra, seen by Marie-Josée Saint-Pierre. Animation serves the film because it places the information in between two worlds: reality and fiction. It's the spectator's job to decide if he believes the information or not, to make his own interpretation, explains the filmmaker. 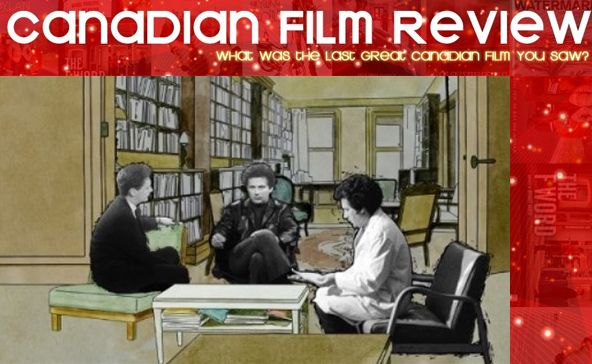 Jutra is a rapturous tribute to a Canadian filmmaking legend. In her stunning 13 minute short Jutra, director Marie-Josée Saint-Pierre provides a captivating glimpse into the life and mind of Claude Jutra. Canadian Film Review: 5 Stars! A perfect tribute to one of Canada’s greatest filmmakers. The film beautifully mixes animation, photographs, archival interviews, and scenes from his films into a stunning collage. The manner in which it is constructed allows Jutra to speak for himself, and to provide the closest thing we will ever have to an autobiography. 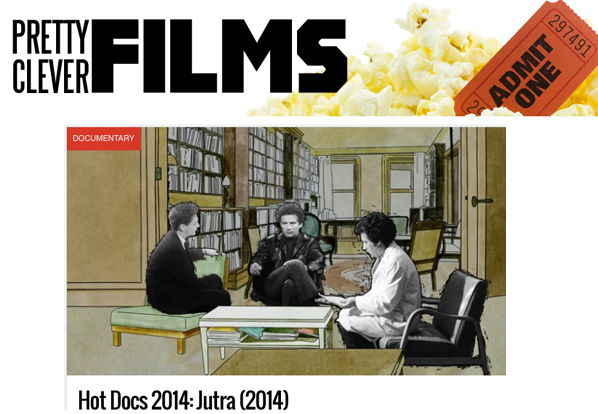 Jutra is a must-see doc for Canadian film fans. Jutra takes the filmmaker’s own words via an immersive mining of archival footage and it puts the great director in dialogue with himself using an intricate collage. The short film Jutra, directed and produced by Marie-Josée Saint-Pierre, will be presented at Cannes 46th Director’s fortnight. The 13 minute film has been unanimously accepted by the jury of the Director's fortnight. 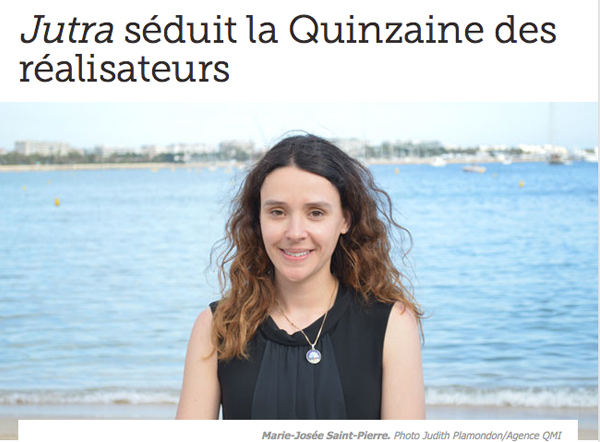 The prestigious Cannes Film Festival just announced the selection of the short film «Jutra» directed and produced by Marie-Josée Saint-Pierre in coproduction with the NFB (Marc Bertrand). An original mix of animation and documentary, Jutra by Marie-Josée Saint-Pierre juxtaposes the two genres to push the boundaries of filmmaking. As such, it aptly illustrates how the NFB, on the eve of its 75th anniversary, continues to serve as a creative space where parallel worlds and uncommon visions can find their place and flourish. 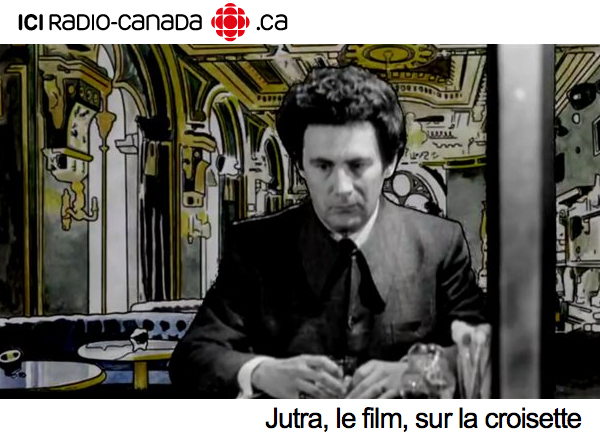 Marie-Josée Saint-Pierre’s intimate (yet expansive and inviting) short-documentary, Jutra, recites to us the evolution and premature demise of maverick Quebec filmmaker, Claude Jutra (1930-1986). Realizing this very fact, acknowledging that “yes, I have indeed been significantly impacted by this man’s work”, well these perhaps biased reminiscences only served to heighten my own very personal sensitivity that all hope is not lost just yet, because a film like Jutra exists.